Ridgetop has developed a broad line of products and technologies over the years. Here you will find Ridgetop’s current corporate, technology, and product overviews, as well as the collected product briefs and datasheets. NASA released a paper jointly authored by Ridgetop on June 18, 2015, entitled "Evaluation of MEMS-Based Wireless Accelerometer Sensors in Detecting Gear Tooth Faults in Helicopter Transmissions." (Click here to download.) 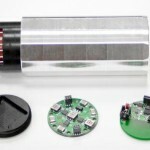 It describes the work that NASA and Ridgetop did to evaluate the performance of Ridgetop's RotoSense sensor, compares it with existing sensor technology, and describes advantages of this innovation. Click here for more information about RotoSense. Ridgetop has developed NightHawk NFF Reduction Tool -- an advanced system for electronic fault detection for the U.S. Air Force. Read about this innovative program in the Air Force's own Launch Stories on-line newsletter.